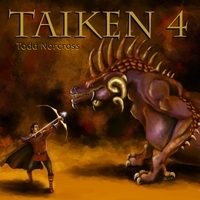 Described as being "a multi-genre musical genius" and "the best musician in martial arts alive today", Todd Norcross has been writing and recording songs for over twenty five years. He earned a Degree in Sound Engineering and Advanced Music Production from the prestigious "Recording Workshop" school in 1997. He has written, recorded and produced 32 albums and well over 600 hundred original songs ranging from pop and folk rock to Japanese and Celtic instrumentals and movie soundtrack scores. Although primarily a finger-picking guitarist, he also plays five other instruments. In 1998, he was recognized as being a "visionary of sound for the next generation of home-spun musicians". As a life-long martial artist, Todd Ryotoshi Norcross has been involved in the martial arts since age 10. He holds Sr. Teaching licenses in To-Shin Do (SanDan), Black Belt degrees in Budo Ninjutsu (Hachidan) Shidoshi license in the Bujinkan (Godan) under Grandmaster Masaaki Hatsumi and Black belt in Uechi Ryu Karate (Shodan). In 2006, he was awarded the ninja warrior name "Ryotoshi" which means "Knight of the Clear Blade of Truth" by Tenth Degree Black Belt Hall of Fame Member Stephen K. Hayes. He is a meditation teacher and lecturer on Philosophy/Cognitive studies in science and how it can be applied in the West. He was given the spiritual name "Ho-Un" meaning "Dharma Cloud" in 2003. He has body-guarded for The Dalai Lama and other celebrities and dignitaries such as Muhammad Ali and John Mellencamp on several occasions. He co-founded a non profit organization (Spirit Quest) in 2004 to help teach self-protection and meditation to inner city youth in six Ohio locations. Todd's articles, blog, poetry and artwork have been published nationally. He is also enjoys oil painting. He earned a Bachelor's of Philosophy Degree in 2012. When not creating music, he owns and teaches at his self-protection school north of Cincinnati, Ohio (www.thedojoinc.com). "I can give you words From my inner being, I can give you sparkling jars Of blueberry jam, I can give you heavy chunks Of homemade fudge, Not enough. Early morning dew On still-yawning flowers, Vari-colored trees Bending and dancing to please you, Still not enough. Yet you have filled all my senses With your music and love there-in, More than enough. I am made happy, drowsy, dreamy. Tranquility covers me, Yet joy shines within. You may do other things, But I believe this is your true gift, Not only enough, but matchless."